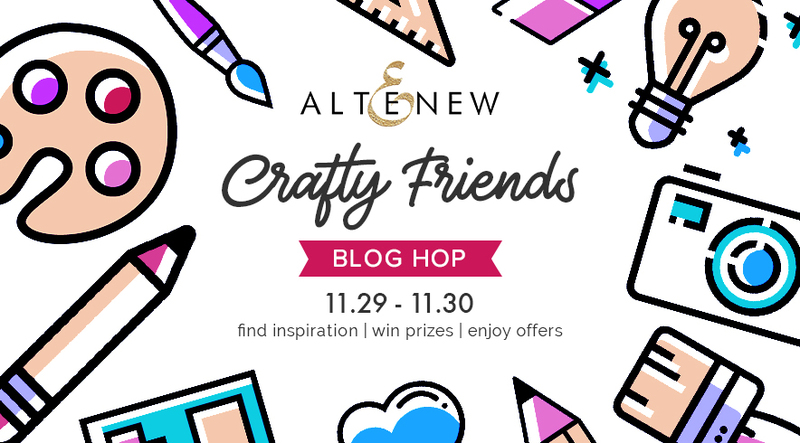 Welcome to stop #19 on the first day of Altenew’s Crafty Friends Blog Hop! If you made your way from Alex Syberia‘s awesome blog, you are in the right place. If not, you can start from the beginning at the Altenew Card blog. They really help keep me crafty and inspired each and every day! I cut out my flowers using several bright shades of cardstock, layered the die cuts over a piece of patterned paper from Keep It Simple‘s Crop Kit Collection Pack, and added fun little details like brads and knotted embroidery thread for the flower centers. I finished the card with a sweet sentiment from the Dainty Swiss Dots Stamp Set. Altenew is giving away a $50 gift certificate to 5 lucky winners and one Altenew Academy class to 5 lucky winners. Be sure to leave comments by Sunday, December 9th, 2018 for a chance to win! 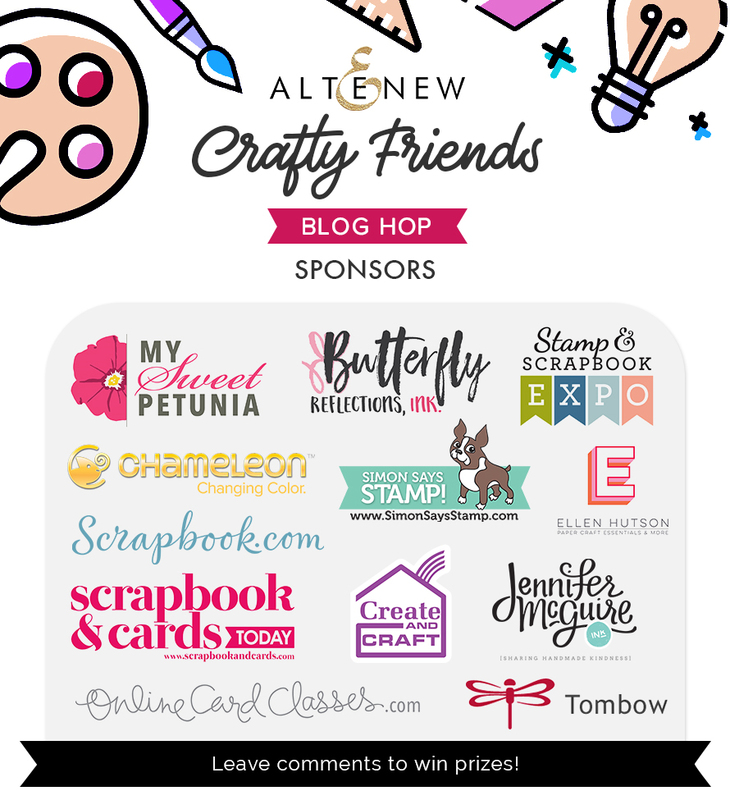 37 winners will be chosen at random from the comments left on all of the blogs listed below and will be announced on the Altenew Card Blog and Altenew Scrapbook Blog on December 15th, 2018. Altenew is offering FREE U.S. shipping with code CRAFTY18 or $5 OFF international shipping with code FRIENDS18 at checkout. Offer valid from 11/29/2018 at 12:01 am EST through 12/1/2018 at 11:59 pm EST. Not valid on prior purchases. Cannot be combined with other promo codes. Your next stop on the Crafty Friends blog hop is with the talented Zinia Redo! If you get lost, you can go back to the Altenew Card blog. Be sure to leave a comment at each stop for a chance to win one of the amazing prizes above. I hope you enjoyed today’s post. Thanks so much for stopping by! This entry was posted in Blog, Card Making, General Crafts, Giveaways, Manufacturers, Paper Crafts, Tools and tagged Altenew, altenew crafty friends blog hop, Card, dainty swiss dots stamp set, Giveaways, layered floral elements die set, Roree Rumph, Stamp & Scrapbook Expo. Great card! I love the use of the textured paper. It seems to give the flowers more depth. Gonna try using more textured paper in my projects. Thanks for the inspiration and the opportunity to be a winner. What a lovely card! Thanks for a chance to win a great prize!! I love stacking to give dimension! Beautiful card! A great quick & easy card! Thanks for sharing! 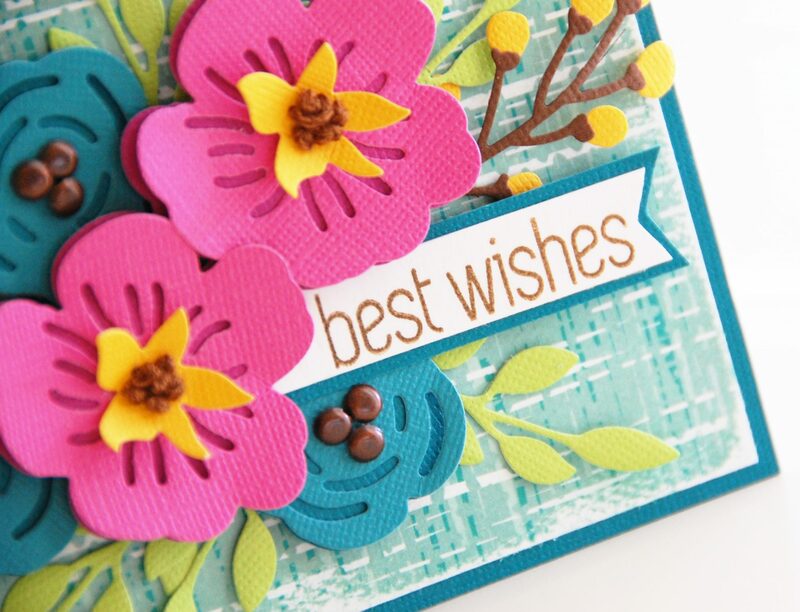 Beautiful card, I am in love with these floral element dies. Very pretty floral arrangement and colors. Lovely card. Really like the details you added to the center of these beautiful flowers! Beautiful card! Love all the accents you added to those gorgeous flowers. 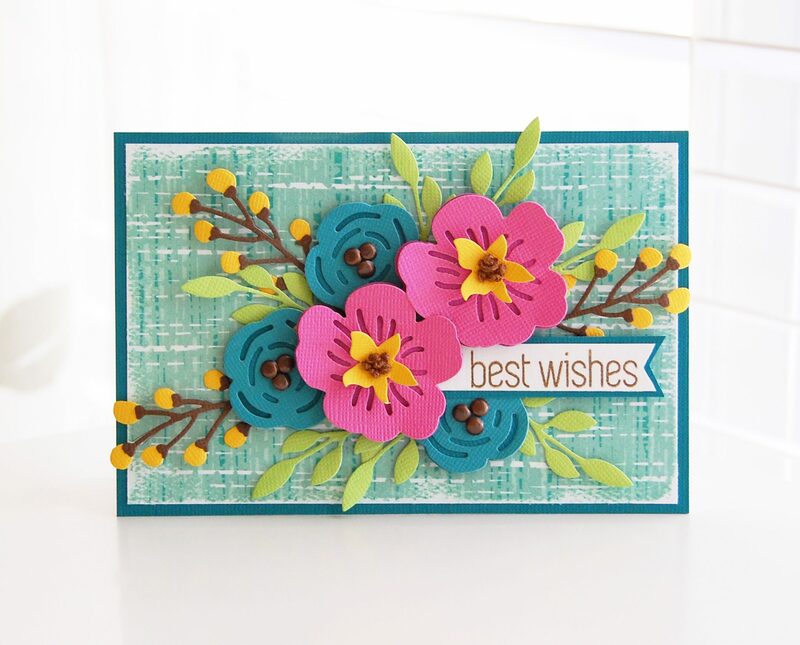 I love the Layered Floral Elements Die Set and your card with it is beautiful! Thanks for sharing it and the inspiration for using this die set. 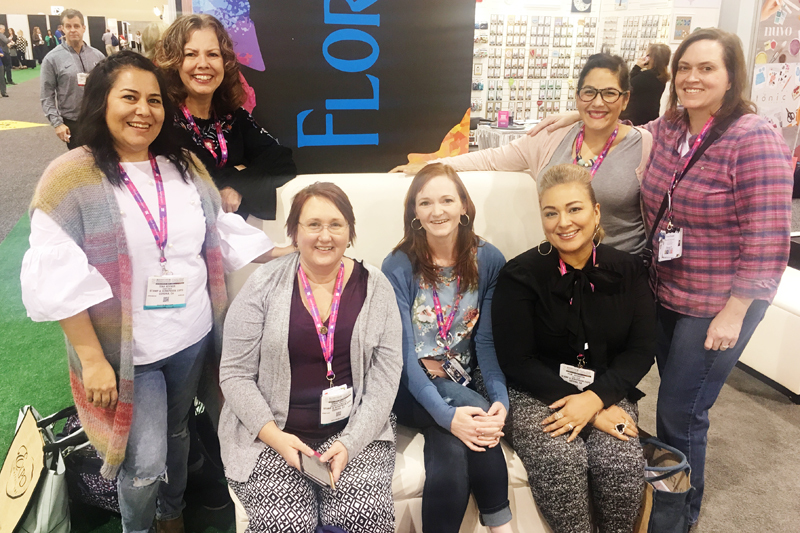 What a cute group of crafters!! I love it. Your card is so sweet and I love the darling flowers. Gorgeous card! Love the color choice, especially the background paper. Thank you so much for sharing! 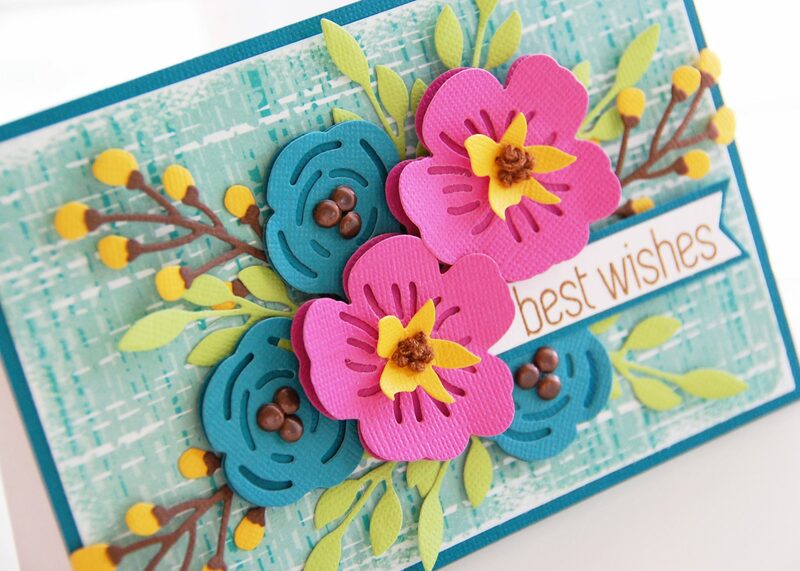 These colors work so beautifully on this bright happy card. Thanks for sharing your creativity. Love the layered look! And vibrant color pallet!